SETTING: Meredith is a rural community surrounded by the White River National Forest, 40 miles from Aspen. This property, once used as a hunting retreat, is in the Hunter-Fryingpan Wilderness, in the Rocky Mountains. Hunting, hiking and biking are just outside the door; fishing and boating are along the Fryingpan River and the Ruedi Reservoir, just downstream from town. The nearest services are in Basalt, about 20 miles away on a two-lane road along the river. INDOORS: The main cabin was built in 1988, the second in 1995, both using lodgepole pine and other native woods harvested and milled nearby. The main cabin has two stories, with pine floors, ceilings and exposed wood walls throughout. The living room and dining room share a two-sided Southwestern-style fireplace with a tile surround. The kitchen has granite countertops, a subway-tile backsplash and stainless-steel appliances, updated in 2010. There’s also a sunny dining nook. One of the bedrooms, part of a suite, is on the main level. The bedrooms upstairs maintain the clean, rustic look, with lots of exposed wood, a claw-foot tub in an en-suite bathroom, and a cast-iron stove in one of the bedrooms. The guest cabin has two bedrooms. The living room has a river-rock wall with niches for a wood-burning stove and a TV, with picture windows on either side. A ladder in the living room leads up to a loft bedroom; the other is on the main floor. Between the two cabins is a hot tub and a deck on top of a building that serves as a changing room. Other outbuildings include a four-car garage, a tack shed, a bunkhouse and a cluster of three offices, all low-slung. 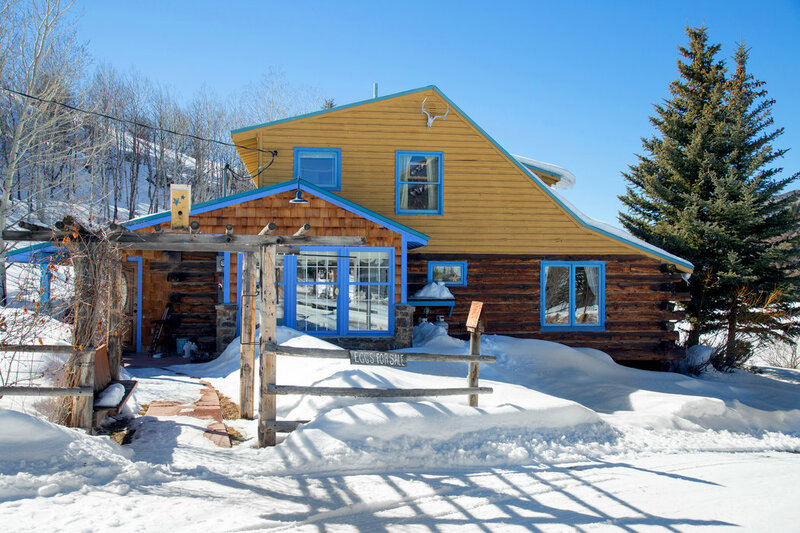 OUTDOOR SPACE: The property is rolling and pristine, with access to both forest service land and the Fryingpan River. SETTING: The city of Mountain Brook is an affluent suburb of Birmingham. Development began in the late 1920, and some of the commercial pockets have a Tudor design. This house is on a three-and-a-half-acre lot, in a neighborhood of wooded, winding streets not far from walking trails and the city’s public high school. INDOORS: The two-story contemporary was built in 1988, with a light-colored stucco and limestone exterior, curving walls of glass and an extensive terrace. Floors are hardwood in most of the house. The living and dining area is a large space with a two-story ceiling, floor-to-ceiling windows and a partial wall with a mottled black-and-white marble fireplace. The stainless-steel kitchen appliances were updated in the late 1990s. Countertops are granite. Next to the kitchen is a sitting room with a fireplace flanked by floor-to-ceiling windows; the ceiling over these spaces is pitched and punctuated by skylights. Also off the kitchen are a family room and a den. Every common room opens to the terrace or the yard through glass doors. The main-level master wing, an addition, has two dressing areas, as well as an upstairs loft that opens to a private balcony. Another main-level bedroom, designed as an au pair suite, has a bathroom and private entrance. Three more bedrooms are upstairs, one of which is yet another large suite with a living room. OUTDOOR SPACE: The lot is 3.4 acres, mostly wooded, with a stream. There are a pool and a tennis court. SETTING: This house is at the Greenbrier Sporting Club, a residential community on the grounds of the Greenbrier, a 10,000-acre resort in the Allegheny Mountains. The resort has been in operation in one form or another since the 1770s; its current anchor is a 682-room hotel. According to the resort, visitors over the years have included Davy Crockett, Debbie Reynolds and 26 United States presidents. Members of the Greenbrier Sporting Club have access to the resort’s amenities as well as members-only amenities, including a spa, a pool, sports courts and a golf course, the Snead. The town, White Sulphur Springs, sits at the edge of the George Washington and Jefferson National Forests, which stretch across the Appalachian Mountains in one of the largest continuous pieces of parkland on the East Coast. The Greenbrier has 15 restaurants, but there’s more dining in Lewisburg, a college town nine miles away. Lewisburg also has an airport. INDOORS: The two-story cottage was built in 2008, with western red cedar siding and a cedar-shake roof. Common areas are on an open floor plan, about 650 square feet. The living area has a fireplace and floor-to-ceiling windows facing the woods and mountains. The dining area is between the living area and the kitchen. Kitchen appliances are by General Electric and Wolf; countertops are Corian, and the custom wood cabinets were made by Mouser Cabinetry, a Kentucky company. Floors are heart pine. There is a large stone porch. The master suite is on the first floor. In addition to a bathroom and a walk-in closet, the room has a ladder leading to a small loft used as an office. A second main-level bedroom is past the kitchen. The third bedroom is upstairs, as is a sitting room with windows on three sides. OUTDOOR SPACE: The house is in a valley on six and a half acres. The property is mostly wooded, with landscaping by Riverbend Nursery, which has worked on properties throughout the area. A creek runs behind the house. TAXES: Annual taxes are $6,000 a year. Membership in the Greenbrier Sporting Club is mandatory. The initiation fee is $120,000, a percentage of which is refunded when the property is sold. Club dues are $15,450 a year.